I love looking out the windows of aircraft. High above the world you watch the ground slide by: mountains, rivers, towns, roads, fields and forests. Sometimes you see something incredibly beautiful, something you'd only see from 36,000 feet above the ground. This photograph is a good example, taken as we flew from Orlando to Cincinnati last week. High over the deep south we passed a storm cloud that was sitting on top of a mountain ridge. 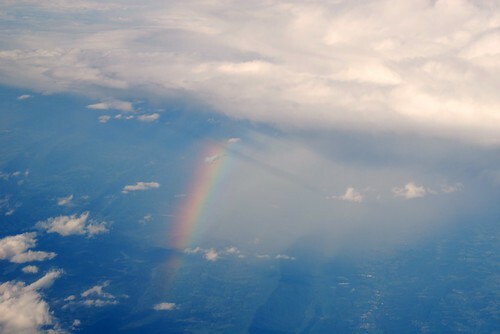 The falling rain was catching the sunlight, and we got a most unexpected view of a rainbow - from above. Could you track the pot o' gold with your GPS?